This was my first ever sewing project! Without any prior experience, I decided to take the plunge and made this rag quilt tote bag for Barbara two days before gathering with our friends for her birthday dinner. It turned out being not so bad for a newbie sewer! I didn't get too frustrated with the construction of the tote. I found these three pretty coordinating fabric patterns at a local fabric shop. I don't remember who manufactures it. They were sold in half yard pieces in a basket so it was easy to pick ones that looked nice together. This style of tote is modeled after the traditional rag quilts that people have made. Usually, the unsewn edges are snipped and you run it through the washing machine to get a raggedy-edge look. It was all straight stitching for the main tote part using my Janome Sew Mini. This machine is so cute...it's not a full-sized one and it's just a tiny bit smaller that a sheet of paper! It won't sew through denim but works fine for lighter weight fabrics. When I got to the part where I had to attach the nylon webbing straps, I got some help from my Mom using her full size Singer sewing machine. I went on YouTube and found different tutorials on how to construct this tote. Using the Stampin' Up! Square Scallop Die made by Sizzix made it so easy to cut the fabric pieces. You need at least a 5-inch square of fabric and you can run eight lightweight layers of fabric through the machine at a time. I sandwiched a 3 1/4 in square of batting between two pieces of fabric and sewed and "x" on each square. I used 27 squares (54 total) for the tote. When I was done with all the sewing, I went and snipped in-between each of the scallops so they would fray in the wash. I didn't a get chance to put it through the washing machine so when I gave the tote to Barb, I told her she could either leave it the way it was or she could run it through her washer to get a more ragged look. Of course I had to put a little something inside the tote so I put together a little goodie bag of various card candy for Barb to use since she is also a card maker. The purple mesh tote is something I bought through Creative Memories. I shopped through my craft desk and found some fun supplies like blank shipping tags, twine from The Twinery, some mailing labels, assorted Papertrey Ink buttons, and some punched butterfly embellies. I also made some gift tags using some background stamps by Savvy Stamps. This is a pic of Barb and our other crafty friend Maria with the green tote in the background at Scrapbook Expo in Sacramento the first week of November. 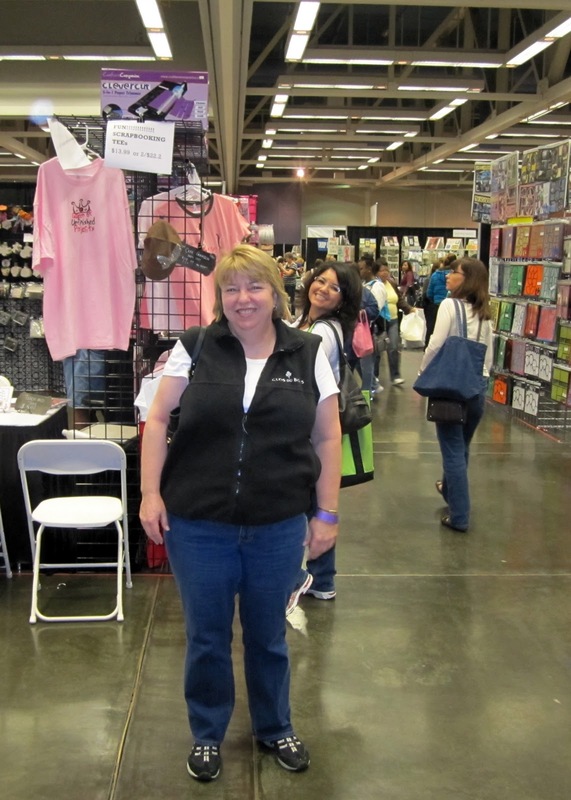 It was Barb's first time ever attending the Expo and she had a blast. Both Maria and I warned her that she might get a overwhelmed with so many craft goods all concentrated in one spot. Some time during our shopping, she did go into a sensory overload but recovered. 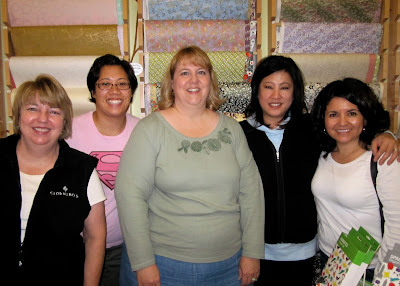 After the Expo, we meet up with Wanda G. for some lunch and of course had to rendezvous at the Paper Garden! I hoped you enjoyed my post for today! I haven't made a rag quilt tote for myself yet so that'll be my next sewing project probably not until after Christmas! Subscribe to my blog by e-mail! I've had an interest in all things crafty ever since I was a kid. 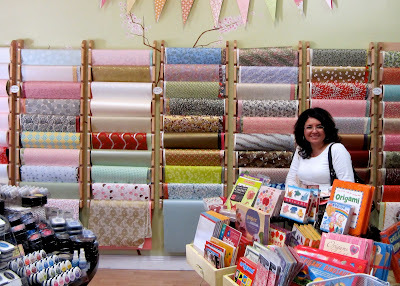 I love paper crafts especially card making and stamping. All along the coast of California is where I have grown up and love so much still. Thanks for stopping into my little corner! All content including (but not limited to) text, images, artwork, and photographs are © Tina Whitted. It is shared for personal inspiration and may not be copied/used for publications, contest submissions, or any monetary gain. Please ask for permission to use otherwise. Thank you!